Fall is the perfect time to enjoy Rhode Island’s great outdoors. Cooler temps, gorgeous foliage and crisp air make for an ideal autumn experience. These are just a few favorites. 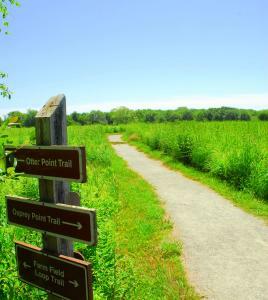 Look for unique birds and salt pond views on the wide woods and farmland trails of the Trustom Pond National Wildlife Refuge in South Kingstown. Trustom Pond itself is the only undeveloped coastal salt pond in Rhode Island, closed to all human activity. 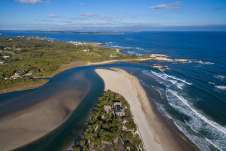 The refuge contains 2.5 miles of carefully positioned hiking trails that pass through a variety of wildlife habitats—fields, shrub lands, woodlands, fresh- and saltwater ponds, beaches, and dunes— without disturbing the animals that call them home. 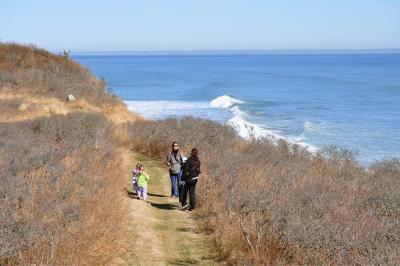 Offering sweeping vistas over dramatic plunges to the ocean below, the Clay Head Trail on Block Island boasts some of the most beautiful views of any hike in Rhode Island. 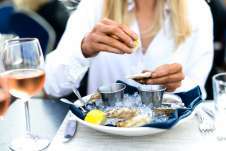 There are plenty of lookout points from which to take in the rolling waves, rock outcroppings, and occasional passing vessels in Block Island Sound below. Located on a privately owned 120-acre preserve, the area around the trail is home to a variety of nesting birds and in autumn plays host to migratory songbirds. Jutting off the main trail away from the ocean is a series of well-maintained but unmarked interconnecting grass trails known as “the maze.” Exploring these trails could add an extra mile or more to your hike. 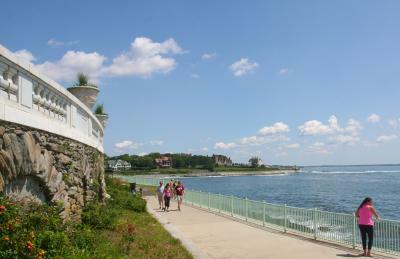 The Cliff Walk along the eastern shore of Newport, RI is world famous as a public access walk that combines the natural beauty of the Newport shoreline with the architectural history of Newport&apos;s gilded age. The walk runs 3.5 miles and about two-thirds of the walk is in easy walking condition. Parts of the southern half of the walk are a rough trail over the natural and rugged New England rocky shore line. Walkers need to be especially careful and alert in these challenging areas. The walk remains one of the top attractions in Newport and is taken by people of all ages. Named for its mile-long face of veined granite quartz, Diamond Hill Park in Cumberland is a great place to do some hiking. Climb to the summit and you can see for miles around on a clear day. Once you&apos;ve gotten to the top of the former ski slopes you come to walking trails from which you can see the Diamond Hill Reservoir to the east and Woonsocket and beyond to the west.